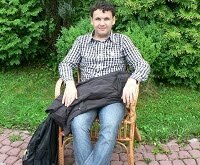 Blogger Maksim Efimov. Photo provided to OIA by Maksim Efimov. Maksim Efimov: "The president of Estonia Toomas Hendrik Ilves shook me by the hand and said he was glad that his country had granted me temporary political asylum since they respect freedom of speech and freedom of expression in Estonia." The Republic of Estonia has granted Maksim Efimov (Yefimov), chair of the region's Youth Human Rights Group and author of the blog text "Karelia is tired of priests", political asylum. The civil rights activist reported the decision to the Agora Human Rights Association, which had been representing his interests. "The Estonian authorities recognised that my criminal case is political and that I am being persecuted in Russia for my political views and beliefs", human rights defender Maksim Efimov said. As well as refugee status, the blogger has also been given a residence permit for three years. Efimov noted that Estonia has received nearly 80 requests for political asylum this year, a correspondent for the Open News Agency reports. "About 10% have been granted. It's not many. I have been the only refugee from Russia this year," Maksim Efimov stressed. According to Efimov, scientists from Russia, the USA and Poland sent letters to the Estonian authorities in his support, and his application for political asylum was supported by human rights organisations in Russia, Estonia, Sweden, Ireland and the USA. "The president of Estonia Toomas Hendrik Ilves shook me by the hand and said he was glad that his country had granted me temporary political asylum since they respect freedom of speech and freedom of expression in Estonia", human rights defender Maksim Efimov said.